Pamper yourself with the first four Sparkle Spa salon books, now available in one shimmering paper over board collection! Brooke and Aly are sisters, but they’re more than family—they’re family business owners! This bind-up includes four Sparkle Spa stories, from the start of their kids-only nail salon to the polished (and unpolished!) adventures that follow. In All That Glitters, sisters Aly and Brooke Tanner have a brilliant idea: why don’t they open up a mini nail salon within their mom’s popular, busy, successful nail salon? 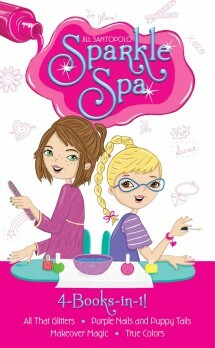 The Sparkle Spa will be just for kids! In Purple Nails and Puppy Tails, Aly and Brooke agree to do doggy makeovers for the Annual Pup Adoption at the local shelter. But dogs aren’t exactly ideal mani-pedi customers, are they? In Makeover Magic, Aly and Brooke are giving manis and pedis for the annual Fall Ball dance at school. But when a flashy new nail salon opens right across the street, the sisters worry that Sparkle Spa’s days might be numbered! And in True Colors, when Brooke breaks her arm, Aly has to bring in a replacement. But what if the new helper is even better at manis and pedis than Brooke is?